My memories from childhood are extremely hazy. Most of what I can recall are fleeting feelings: the bliss in skipping around my Kindergarten classroom as I sang about the days of the week, the joy in jumping up and down on my parents’ bed as I watched “David the Gnome,” the curiosity in having accidentally swallowed a piece of gum, the preceding anxiety and subsequent relief in remembering my steps for a dance recital. Practically all my childhood firsts are long forgotten; I cannot recollect the first book I ever read by myself, or the first tooth I lost, or the first movie I saw in a theater. But I can remember the first time I was teased for being Asian. I was with my family enjoying a vacation, somewhere near a harbor or a lake, and wanted to take a closer look at something near the water. I broke away from them for a minute and walked down a ramp, where a few older kids were perched atop a ledge. “Ching, chong, fung,” or something to that effect, they sneered, pulling their eyes taut with their fingers. I didn’t know what it all meant, but I instantly felt embarrassed. I couldn’t have been older than 6, maybe 7. Until that point, I had positive, pleasant feelings about my eyes. As one of my earliest toddler “commands” I can recall, my mom would say, “Beautiful eyes” to me, and I’d give her the biggest ear-to-ear smile I could form, my eyes naturally slanting, my heart full. Why were these same eyes, passed down from my ancestors, suddenly a source of shame? 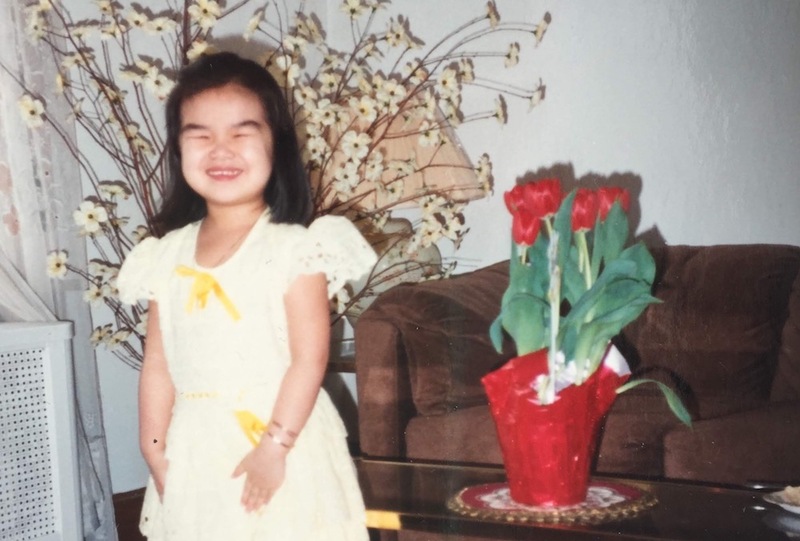 Today, as an adult reflecting on my childhood, I realize that was the moment when I became aware of my “Asianness” and internalized the discomfort over my appearance. I would talk in loud, clear English in public spaces so that others would know I was not only Filipina, but American too. I preferred eating pizza and hamburgers to rice and chicken adobo. I sought to blend in as best I could because I didn’t want to be seen as different. I didn’t want to be seen. Since that vacation, there’ve been countless more times I’ve encountered racism in its many forms: from friendly, welcoming strangers asking me where I’m from and repeating the question after telling them the city in which I reside, to angry, driving strangers telling me to go back to my country, to misogynistic, catcalling strangers (“Smile for me, China doll”) forcing me to confront the intersectionality of my race and ethnicity with my gender. These occurrences, I’m certain, are not just unique to my personal story; rather, they connect me to a larger narrative of what it means to be an Asian American female xennial living in today’s United States. These days, I still meet the innocent microaggressions and intentional xenophobes with embarrassment—but instead of being embarrassed of myself, I’m now embarrassed for the other person. And over time, I’ve grown especially fond of rice and chicken adobo, and I find myself longing for my late grandmother’s home-cooked recipes. And I guess this is what happens after you grow out of the self-consciousness of your childhood and adolescence, or when you hit adulthood and realize that the person you are today has everything to do with the values your immigrant parents imparted on you, or after you start having kids and want them to feel grounded in the truth that their identities are rooted in their parents’ heritages and histories. 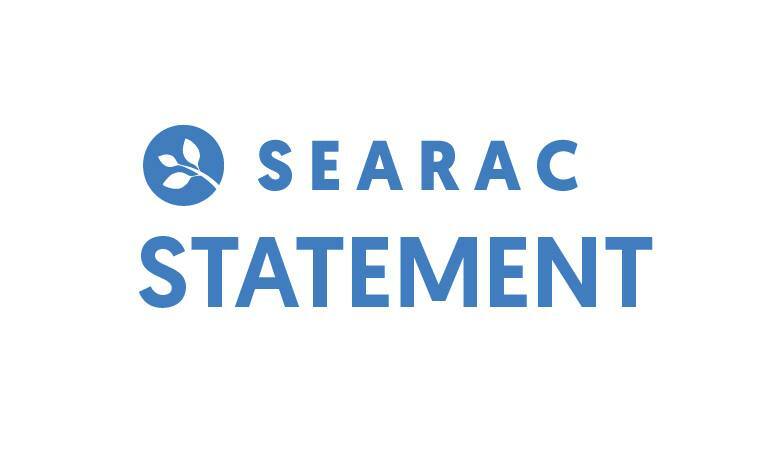 Perhaps this is why my life truly feels like it has come full circle, coming to work for SEARAC. 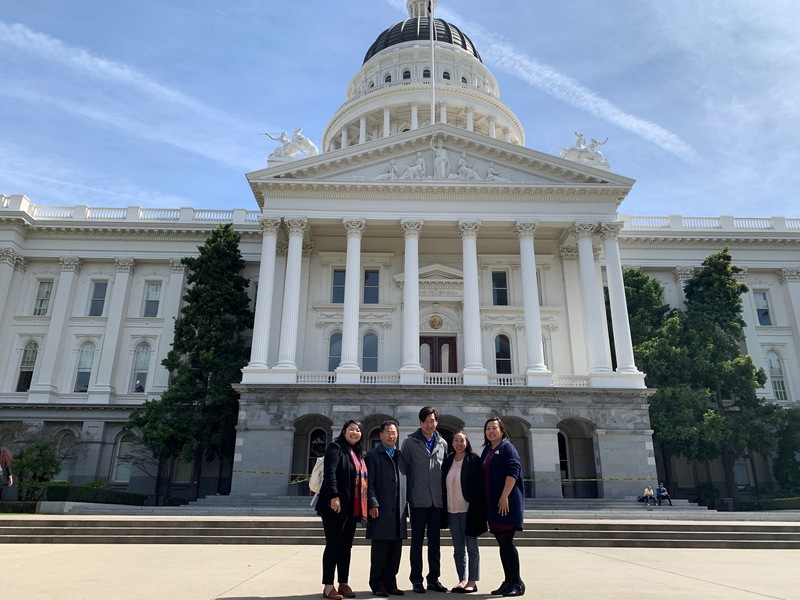 At SEARAC, we are fully committed to working toward making sure Southeast Asian American communities and ally communities of color are seen. 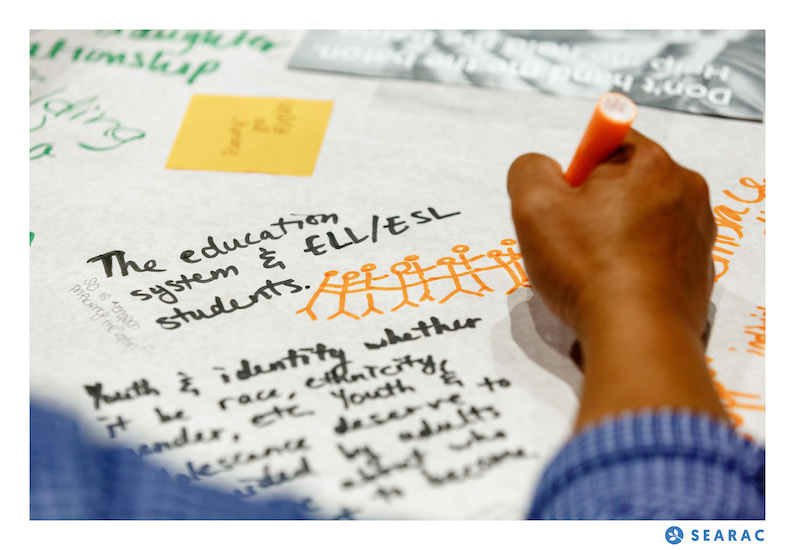 We call for disaggregated data so that our public institutions can see us and create targeted and culturally competent solutions to close gaps in educational as well as health outcomes. We advocate for race-conscious admissions policies so that schools can see us for the diversity of thought and experience our unique immigrant stories offer, which will help set us on a path so that employers can see us for our valuable perspectives. We speak out against a broken immigration system so that elected officials can see us and make things right for our families. 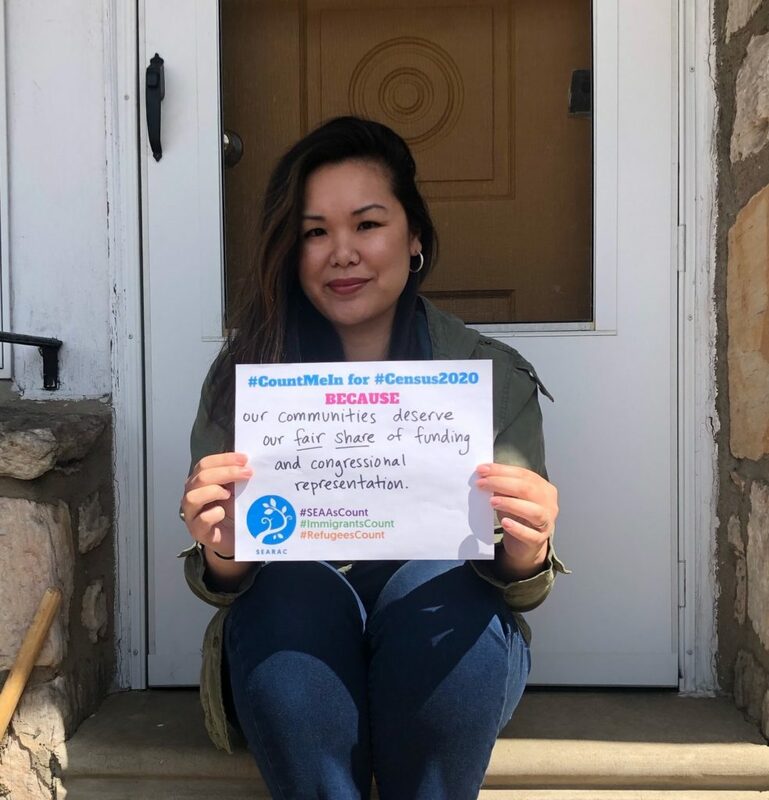 We seek to mobilize our communities to show up for Census 2020 so that government can see us to allocate the appropriate funding to needed services and programs and to draw accurate congressional districts for fair representation. My goal is some day for my children, who have beautiful eyes that are part mine and my ancestors, to think back to when they realized their own Asian American identity and have that memory be one of love. My 17-year-old nephew, who has proudly referred to himself as a “Black-ipino” since he was 6, maybe 7, gives me hope. Hope in this next more woke* generation. *Examples here, and here, and here. Hope that my kids are able to stand confidently when they eventually confront the ugliness in humanity. At some point, they will encounter it. And hope for a future where all communities of color are truly seen — and celebrated. Elaine Sanchez Wilson is SEARAC’s Director of Communications and Development. To contact her, email elaine@searac.org.